3. 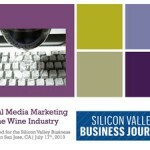 + Road Map n  Social Media Overview and Best Practices n  Wine Industry Case Studies and Resources n  Specific Tools (Time Permitting) Ask Questions Anytime! 4. + Social Media Marketing, Defined n  Social media marketing as building a social network of fans, followers and connections using relevant and interesting content that allows businesses to reach and engage more people and drive more sales. 6. + Social Media Marketing is Story Telling n  Consumersexpect more than just a product or service, they want a story to engage with. n  What is your brand’s story? 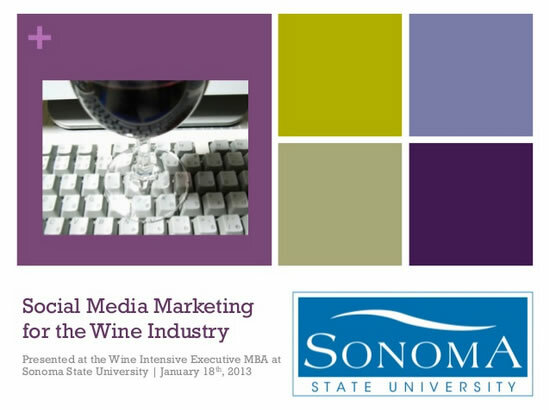 How can you 49% of American wineries have a make storytelling a dedicated marketing manager practice? who creates and publishes content on social networks. 12. + Social Media Return on Investment n  Expect 6-12 months to see an impact on sales n  Allow time to grow your network… like growing a vineyard, you must allow the the vines to grow before you can expect to get fruit. 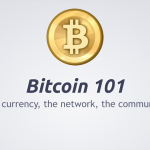 n  Think of building “Social Currency” … the more good will you generate with fan, the more likely they will share your product. 38. + Facebook vs. Twitter n  Facebookis the superior social media platform for generating sales (48% for Facebook vs. 28% for Twitter). n  But Twitter is seen as better at capturing media attention (53% for Twitter vs. 32% for Facebook). 40. + Pinterest – A Social Scrapbook n  What is Pinterest? n  Pinterest is a visually- beautiful, digital bulletin board that takes your magazine cutting and scrapbooking habit online, and makes it searchable for others with similar interests. n  Visual Lovers Paradise n  Pinterest is perfect for wineries and wine regions looking to engage potential customers online with cool visual (image + video) elements of their winery and wines, pairings and recipes, new label ideas, etc. 41. + Instagram – Photo Blogging n  Mobile-Based Platform n  iPhone/Android Smartphone Cameras n  Filters for the Romantic n  Easy to apply filters allow for artistic photos n  Photographer on Staff n  Define Instragram photographers who can take photos of the everyday work, events, behind the scenes and lifestyle shots. 46. + Creative Commons Copyrightn  This work is licensed under the Creative Commons Attribution- Noncommercial-Share Alike 3.0 United States License.n  To view a copy of this license visit http://creativecommons.org/licenses/by-nc-sa/3.0/us/ or send a letter toCreative Commons, 171 Second Street, Suite 300, San Francisco, California, 94105, USA.